I adore folk tales, particularly stories that deal with creation, be it the creation of the world, of mankind, or of an element of a society’s culture, such as traditional music. 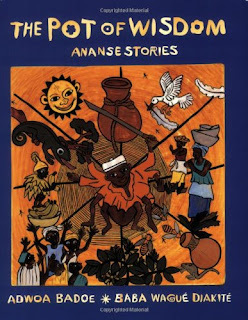 Some of my favorite folk tales come from West Africa and feature Ananse (or Anansi or Kwaka Ananse or Anancy), who is sometimes a spider and sometimes a man. Regardless of which form he takes, he is always small (and, if he is a man in the story, “small” can be interpreted as elderly, thin, and hunched over, or it can mean short in stature). Ananse legends—or “Spider Tales”—vary in topic and from region to region. They even survive in the southern United States as “Aunt Nancy” stories. All Spider Tales have one thing in common, though: They are about someone small or seemingly insignificant who does great things—oftentimes tricking gods or powerful beasts who, one would think, would be too clever to be fooled by someone like Ananse. Such stories are appealing, to me, and always have been—because I consider myself to be a very ordinary person. As a child, I often felt “little,” and in more ways than just my size. I longed to do great things, but my influence was so limited. I relished the Aesop’s Fables, which were, at the time, some of the only legend-type stories of which I was aware. I thought it was so great that the tortoise (who represented the ordinary person, to me) was able to beat the flashy, speedy hare (who represented everything I could never be, such as an Olympian). And when I learned from a teacher that the alleged creator of the fables was a slave named Aesop, who lived in Greece, I was even more delighted. How wonderful that someone whose contemporaries would have considered the lowest of the low could write such enduring stories! How ironic! When I started studying folklore, I saw that these kinds of “little guy” stories—these Spider Tales—are common throughout the world, whether they feature Ananse the Spider, Tortoise, or even the youngest son of the miller. That latter example is actually of a fairy tale: Puss-in-Boots. Fairy tales sprang out of the folk tale tradition, as did other types of stories, such as dime novels (see my Gab Bag post about dime novels here), early feminist literature, and even superhero stories! After all, Peter Parker is one ordinary guy...until a spider bites him and transforms him into Spiderman! So if you (or your child) are fond of stories where the supposedly insignificant hero or heroine does big things, try to get your hands on some folk tales! 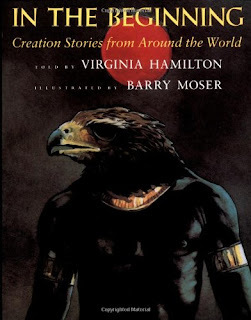 I recommend starting with Virginia Hamilton’s Newbery Honor-winning collection of creation myths, entitled, In the Beginning: Creation Stories fromAround the World. The illustrations in this book were done by Barry Moser, and they are amazing. What are some of your favorite Ananse-type stories, whether folk tales, fairy tales, or modern novels? Sound off in the comments! *Note to Teachers & Home-Schooling Parents: Try selecting a few short stories from each of the genres I mentioned in this post, and read these stories with your students/children. Then challenge them to create a Venn Diagram, where they will list similarities and differences between these stories. For a link to an online Venn Diagram-making program, click here. Next, you could try out some recipes from Ghana (which is where Ananse Stories are suspected to have originated), a list of which can be found here. Then, how about making some traditional West African masks? The possibilities for across-the-curriculum study are endless! My brother and I studied that period of history for a while, and my mother (ever one for enforcing extra reading) got a pile of Anansi books from the library. Now, maybe it's because those were just another bunch of "Mom books" (she makes us read one of her books for every book we read for fun), but I didn't really care that much one way or another about them. But i did find it interesting, in retrospect, the type of tales connected with him. There was one - something about a snake, immortality, and reaching the bottom of the ocean (via eating a bunch of stones, I think) that struck me as being so different from our own tales as being from an entirely different world - which in some ways, it was. Jaina, thank you so much for your comment! I love that your mom made you read other Ananse books! And thanks for sharing your thoughts about the snake story! I'm not sure if I've read that one or not! I'll have to search around a bit to see if I can find a version of it. You can buy a version of my favorite Ananse story, which is about how Ananse acquired stories from the Sky God here. And you can watch a YouTube video of the animated story here. I loved Ananse stories growing up! I vaguely recall one where he bested a fox, or something like that(My guess is this happens a lot). It was epic.